Emirates, Etihad, flydubai, Air Arabia and Al Fursan took to the skies in precision formation yesterday (December 2) to celebrate the UAE’s 47th National Day, as well as commemorate the legacy and values of HH Sheikh Zayed. 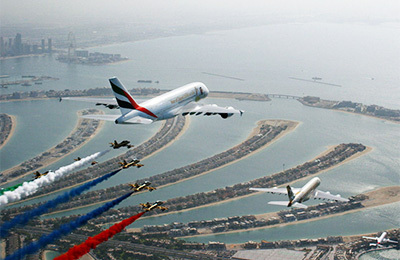 The spectacular flypast - a world-first and a UAE civil aviation milestone - involved over 11 aircraft: a flydubai Boeing 737 MAX 8 (Zayed 1), an Air Arabia Airbus A320 (Zayed 2), an Etihad Airways Airbus A380 (Zayed 3) and an Emirates Airline Airbus A380 (Zayed 4), as well as seven Al Fursan aerobatic display jets from the UAE Air Force. The carefully choreographed ‘stair step’ aerial formation began this afternoon at 1300hrs, when the aircraft took-off from Dubai World Central Al Maktoum International Airport. Once all of the aircraft established their holding positions with altitudes ranging from 2,000 feet to 5,000 feet with a 1,000 foot vertical separation, the formation commenced. Over the skies of Ras Al Khaimah, each aircraft adjusted its speed and turned to achieve a trail formation. The aircraft then descended into their positions and vertical separation was reduced to 300 feet.